If you’re looking for somewhere to go on a torrential raining Bank Holiday Monday then Bletchley Park is a good bet. We got a little bit wet moving between buildings but it was mostly inside so not too bad. I’ve always found the history of wars interesting. 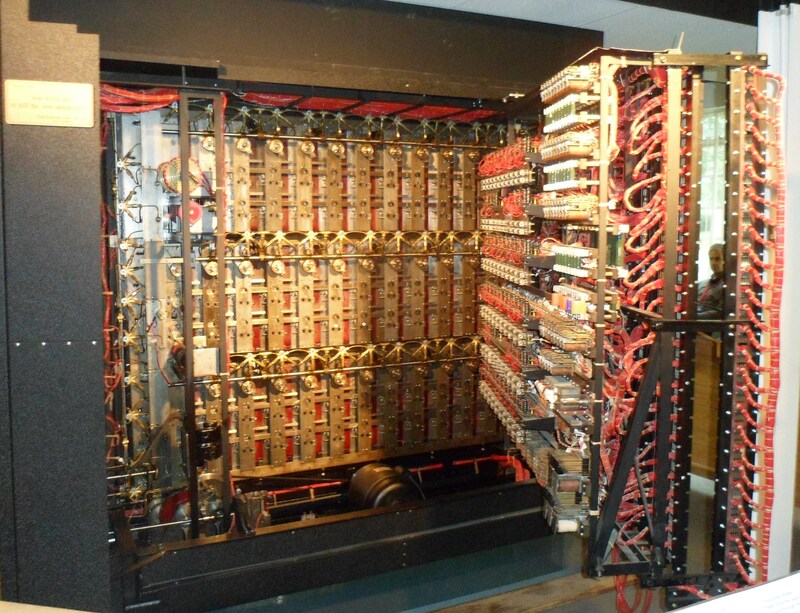 Without the German invention of the Enigma Machine we wouldn’t have needed to create the ‘Bombes’ to crack the codes. Sadly if the world was waiting for my assistance to crack the codes we’d be under the rule of Hitler by now. My brain just doesn’t work in the way required to crack such a complex code. It was truly fascinating to stand in front of one of the sample machines and look at the wiring set up. It’s like a big Mechano set with thousands of wires, so many you can’t begin to tell where they start and end. I’d hate to have the responsibility of wiring them all up! 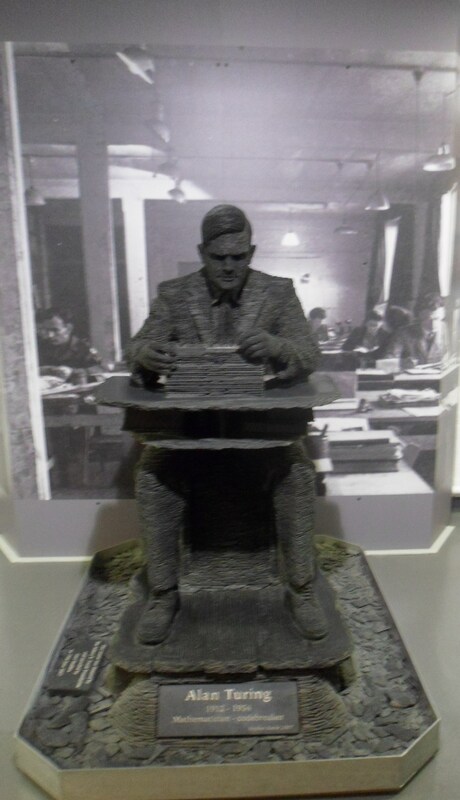 I loved the statue of Alan Turing it was really inspiring. 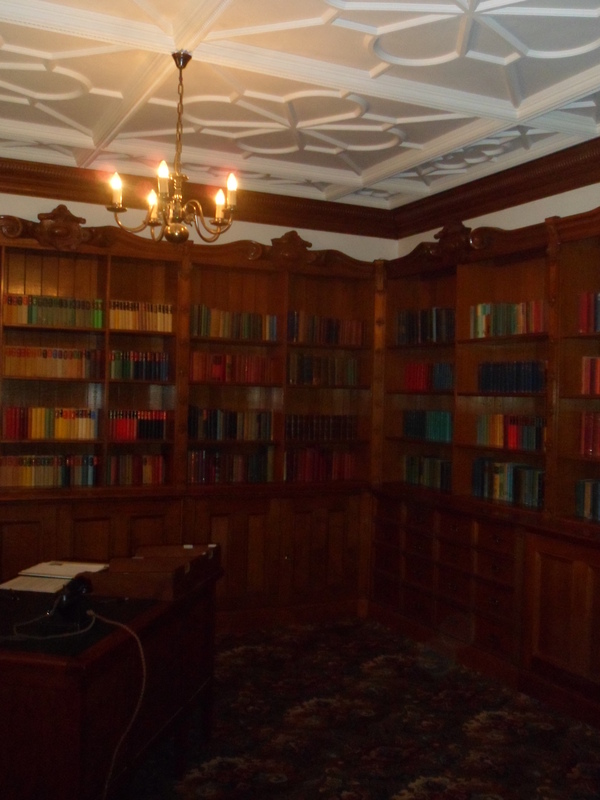 The Mansion House was really beautiful and had a classic library. 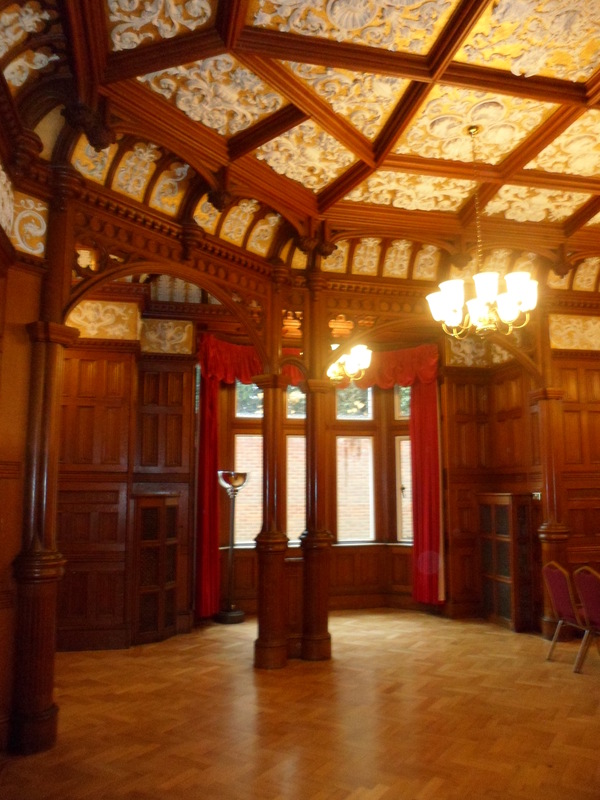 I loved the ornate gold ceilings of the ballroom and the wooden panelling. 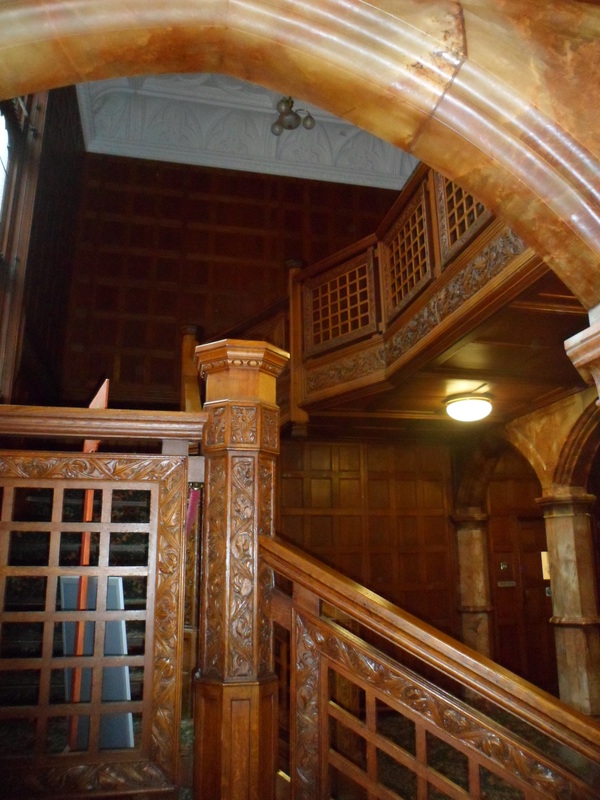 They also had marble columns and a stained glass roof over the reception room. I find gargoyles fascinating and there is a pair of them guarding the entrance. I’ve always dreamed of living in a house like that with a ballroom and a library, maybe I did in a former life! You get an annual pass to the park so you don’t need to fit everything in all in one day, if you live locally enough to travel back. 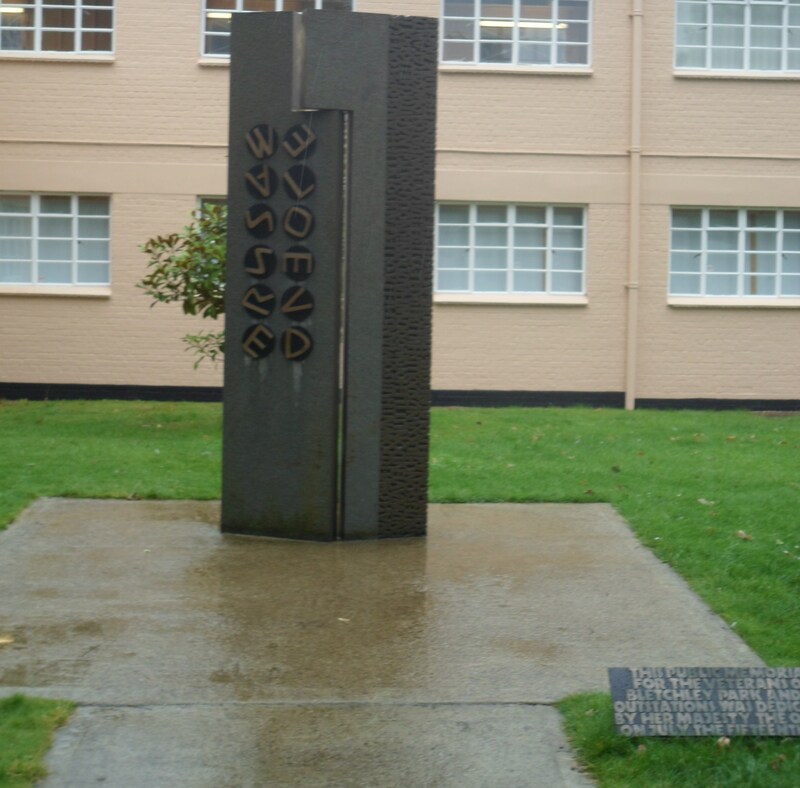 The work of the people of Bletchley Park during World War 2 cannot be underestimated, it is said they reduced the length of the war but at least 2 years and they deserve to have their stories told and their place in history remembered. It’s fitting they have their own memorial. See if you can crack their code! I’ve always thought it is important to remember the sacrifices of all the men and women who fought in the First and Second World Wars to pave the way for the free life we live today. I marched in many a Remembrance Sunday walk carrying the flag of the Brownies or the St Johns Ambulance. Even now I always have a moment of reflection on Remembrance Sunday and say a silent thanks to those who fought and died to bring freedom once more to Europe. I remember being in the cinema with my Nan watching a movie, (I can’t remember what it was) Hitler came on the screen and she said ‘How could one man cause all those horrible things to happen.’ I really didn’t know what to say. The men who stood on various types of boats sailing across the English Channel to France on the 6th June 1944 had no idea what would be waiting for them on the other side. It is hard to imagine what that journey would have been like, Saving Private Ryan gives an account of it that is shocking and probably an exaggerated sense of what happened. According to Wikipedia 156,000 troops were involved in the Normandy Invasions and on D Day there were at least 12,000 Allied casualties with 4,414 confirmed dead, German casualties were around 1,000. Of the first wave landing on the beaches many barely made it off the transport that carried them, gunned down by the German forces camped out in gun emplacements overlooking the beaches. Those beaches were of course Utah, Omaha, Gold, Juno and Sword. Some men drowned, some died of their injuries as they lay waiting for help that didn’t come, some were killed outright. 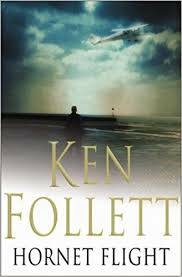 The beaches and sea would have been tainted red with blood. The beaches were mined, covered with wooden stakes and barbed wire to slow the oncoming forces making them easier targets. The heaviest casualties were at Omaha beach. Whenever they have a memorial to the First or Second World War there is always a story in the newspaper of a long forgotten person and their incredibly heroic deed. There is always a story of a veteran going to extraordinary lengths to remember his fallen friends. This year an 89 year old man left his Nursing Home in Hove and traveled to Normandy causing a bit of a stir as they thought he had gone missing. It turned out he just decided to make his way to Normandy. Another 89 year old man decided to do a tandem parachute jump to mark his original jump in 1944. You wouldn’t get me jumping out of a plane once let alone twice. He described his decent as ‘poetry’ which I think is just incredible. There is no denying the world would have been a different place had the Germans succeeded in their plans. Human nature is a wonderful thing but at times can be easily corrupted by the will of powerful people. There will always be people brave enough to stand in front of evil and do everything in their power to stop it. It is important for children to learn about the World Wars at school and the importance of what was achieved. The sacrifices that were made by so many should never be forgotten. I have always wanted to visit the World War 1 battlefields and World War 2 beaches. I feel paying my respects and saying a private thank you is the least I can do for the sacrifices of those men who fought there. Later this month I will be visiting The Somme and I know it will be an emotional experience, but one I am ready for.